Urban Sketchers Seattle: Saturday July 21st Northwest Regional Sketchcrawl! Saturday July 21st Northwest Regional Sketchcrawl! Join us Saturday July 21st for a Pacific Northwest Regional sketchcrawl at the Museum District of Tacoma. Meet fellow sketchers all the way from Portland to Vancouver B.C. and east to the Tri Cities and northwest to Whidbey Island and Anacortes. 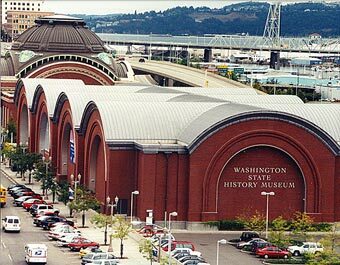 We will be meeting all out of town sketchers at 11:30 a.m. at the front entry of the Washington State History Museum. Early birds are welcome to come earlier to get in a sketch before that official meet and greet. There are great opportunities for sketching some historic buildings in this district or walk across the bridge to the Tacoma Glass museum and sketch. 1:00 pm we will reconvene.... at the amphitheatre at the Washington State History Museum...Have lunch at the Swiss share sketches and then if you are game to sketch the afternoon...sketch for another couple of hours and meet for afternoon coffee or beer at 4:30 or 5:00 p.m. We look forward to a big group! Street parking is available for $1.50 all day. Check out the google groups discussion if you want to carpool. See http://seattle.urbansketchers.org/p/updated-info-july-21st-pnw-regional.html for more information. We're hoping someone can be there to meet you and represent us(USkTri-Cities). I will be just returning from the Symposium in Santo Domingo, then departing on the 21st for southern California for a few days. Otherwise, I would be there with you. Shucks. Next time, ok?